He took a break in the middle to play in the Waste Management Phoenix Open (you know, on the PGA Tour), but 19-year-old Matthew Wolff picked up this week where he left off last fall by winning the Amer Ari Invitational in Hawaii this weekend. Wolff beat his teammate Zach Bauchou and Edwin Yi of Oregon by three each by firing a 65 in the final round on Saturday evening. He finished the tournament at 18 under and has now won four straight full field stroke play events. 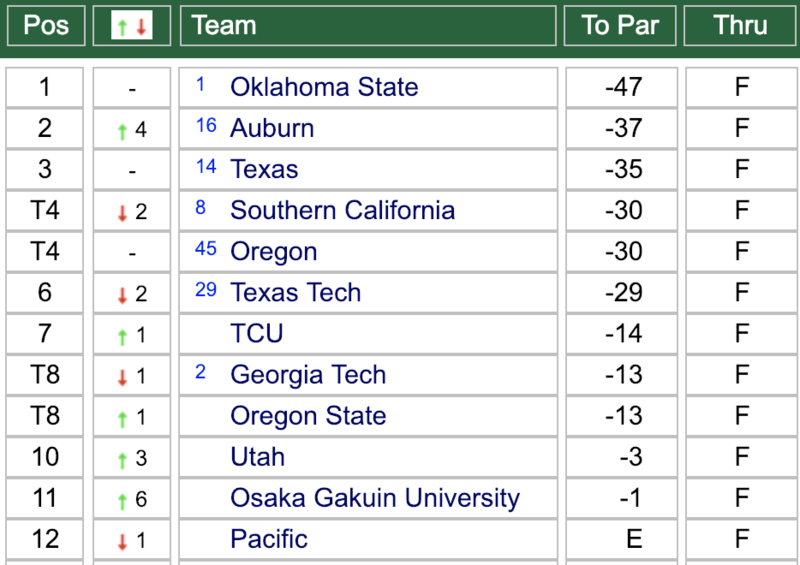 Oh, and OSU took the event on the team side by 10 strokes, too. Wolff broke an OSU tie with Hunter Mahan, Peter Uihlein and Scott Verplank (among others) for most wins as a sophomore with four (the previous record was three). As a reminder, it’s the second week in February. With one more win he will own the most victories (five) by any OSU golfer in a single season … ever. It’s currently shared by Wolff, Charles Howell, Verplank (his senior year) and others. Some more stats (and for the sake of context: only Charles Howell in 2000 has ever cracked 70 for a season-long scoring average — what Wolff is currently doing is basically unprecedented). Matthew Wolff has won his first 4 full-field events of the season! A 65 today in Hawaii gave him a 3-shot win (69-64-65). He has a 67.3 scoring average. Matthew Wolff is undefeated in four starts this season. He's beating the field by 17.5 strokes per tournament. Wolff finished T50 in the Phoenix Open, where he got a sponsor exemption last week with the big dogs of professional golf, but you could tell he has superstar inked all over him in permanent marker. It doesn’t take a lot of reading between the lines here. Wolff is the best prospect OSU has had in a long, long time. Better as a prospect than Uihlein, Rickie Fowler and Hunter Mahan. He’s easily the favorite to win the Fred Haskins Award and would be OSU’s fifth golfer to do so (but first since Verplank in 1986). Golfweek noted recently that we should enjoy the show for now, because it’s about to go global. I don’t know what’s possible this year for Wolff. Last year’s Haskins winner, Norman Xiong, won six (!) times, which sounds crazy until you remember that Wolff has four months to get two more wins and match him. Everyone I talk to in golf gets that silly smiling starry-eyed stare when I bring up Wolff’s name. Top 50 player in the world right now. Future No. 1 player in the world. Multiple major winner. These phrases are tossed about as if they have already happened, not as if they are future events that could happen. But for now, Wolff is doing the most important thing he can be doing in college golf. He’s learning how to win and he’s winning. As good as his freshman season was as OSU won it all, it lacked a key part of the resume, wins. Now it doesn’t. Now that part of the resume is full, and the ceiling is being completely taken off the expansion of this home. Matthew Wolff can’t stop winning golf tournaments, and that might be a sentence that’s true for a long, long time. The post Matthew Wolff Can’t Stop Winning Golf Tournaments, Could Soon Hold OSU Record appeared first on Pistols Firing.